Have you shot any new source material lately? Don’t be one of those VJs who turns up with the same archive.org clips to every show. You don’t need expensive gear to get interesting results, you don’t even need to go outside. 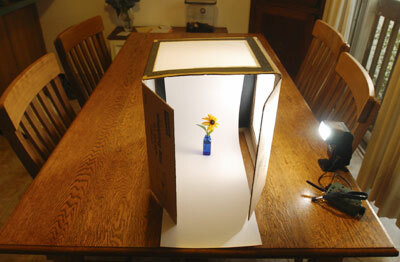 Just point your feed reader at Make:Blog and find yourself a cardboard box. Strobist, the photography lighting guru brings us the $10 Macro Photo Studio. Both of these projects are extremely cheap and easy, you can produce new, original material in the afternoon before your next gig. No excuses! If you’re VJing night after night with that nature documentary time lapse of a fox being eaten by maggots then you’re not trying hard enough. Both links via Make:Blog, for all your DIY love.